The 31-year-old Germany international suffered the problem in Friday's pre-season draw with Lens and did not travel with the squad for two friendlies in the United States. Wenger confirmed on Tuesday evening that Mertesacker is set for "months" on the sidelines after undergoing surgery. "We have bad news on Per Mertesacker," he said in quotes on www.arsenal.com, ahead of a clash with the MLS All-Stars on Thursday. We found out the next day that it was much more serious than expected. I don't know that, it's months, but I don't know how long he will be out for." The injury comes as a blow to Wenger, who also left fellow centre-back Gabriel in England and has given Laurent Koscielny an extended break following his exertions with France at Euro 2016. That means, at 21, Calum Chambers is his most experienced defender on the US tour, with new signing Rob Holding also expected to play a major role in both pre-season matches in America. 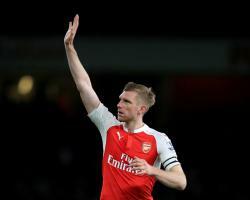 But with the new season looming, Wenger admits the set-back with Mertesacker - who had dropped out of the team towards the end of last season as Gabriel and Koscielny became the preferred partnership - means he will be forced to look for another defensive recruit. "We have to look for an option to get a bit more experience," he said. With Per being out, we are a bit short on the experience front and we are looking to bring somebody in." But Wenger was in no mood to offer up any suggestions of who he may be tempted to bring in after responding to Lyon's statement issued on Tuesday morning which claimed they had rejected a bid from the Gunners for striker Alexandre Lacazette. "Lyon is responsible for their own statements," he added. But I cannot tell you much more on that."